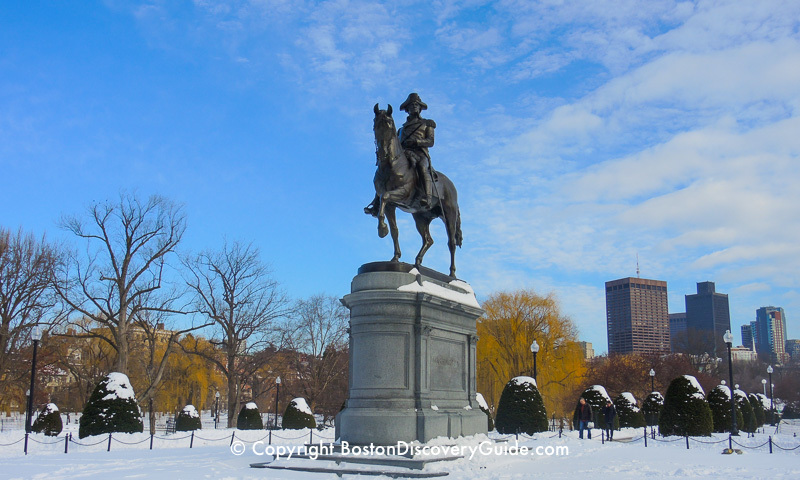 Let's be honest - going on a winter walking tour of Boston in the snow is not what most visitors and tourists have in mind. 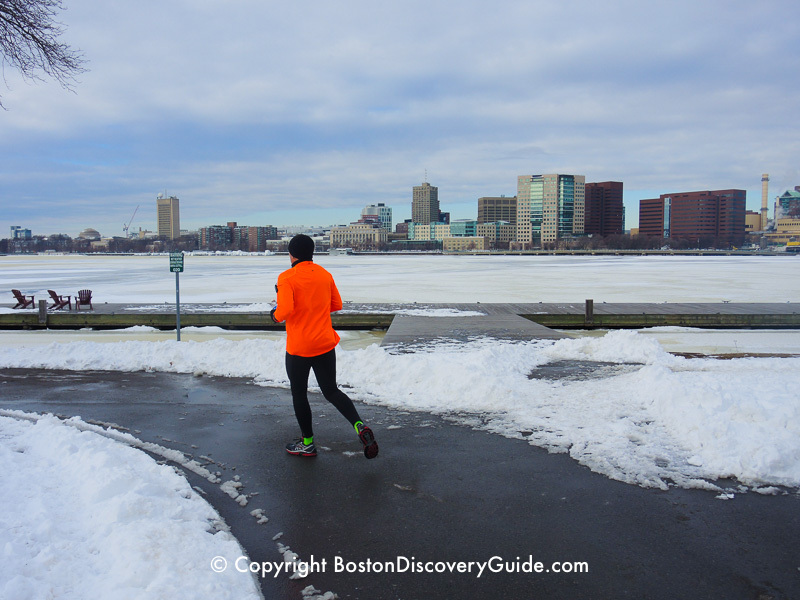 But if you visit Boston during late fall, winter, and early "spring," you may find yourself here on a day or a weekend when snow blankets the city. 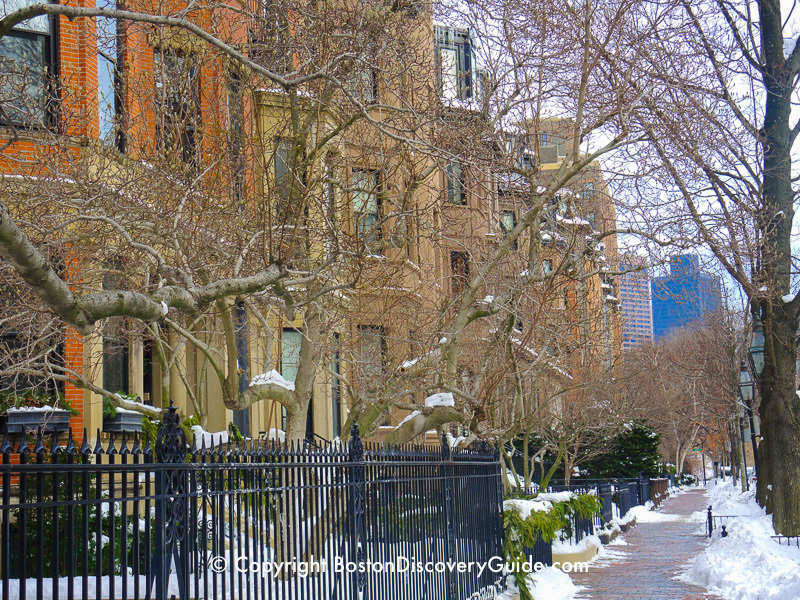 This special self-guided walking tour lets you enjoy Boston at its snowy best! 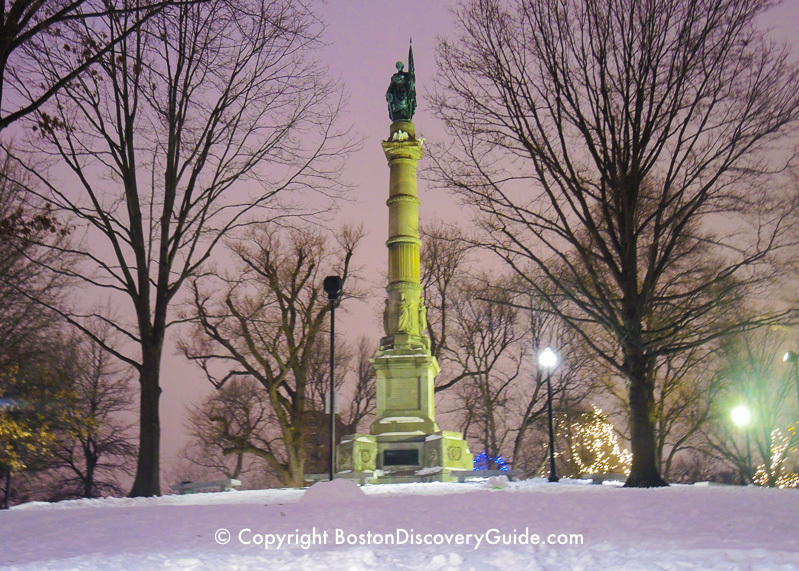 This walking tour begins at the George Washington statue in Boston's Victorian-era Public Garden. Enter the park through the center entrance on Arlington Street, across from Commonwealth Avenue Mall and the Taj Hotel. 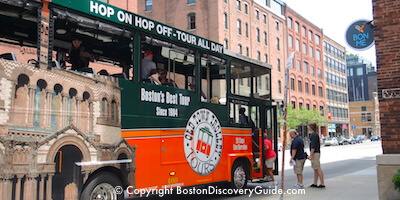 Check the walking tour map at the bottom of this page to find the location. 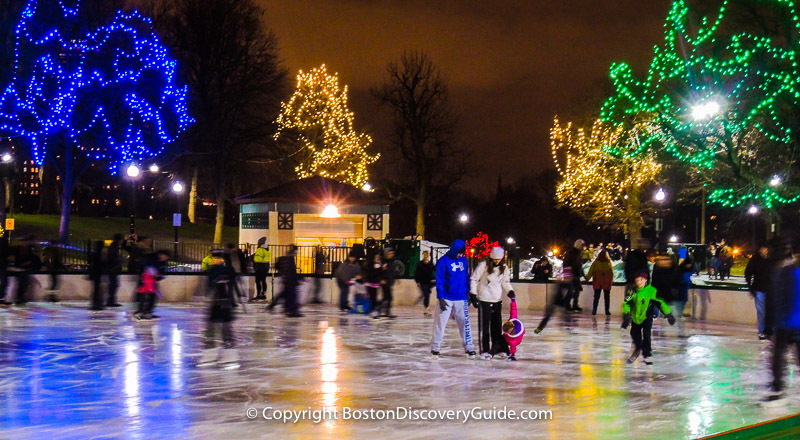 Throughout the rest of the year, the Public Garden attracts hoards of visitors with its colorful flowers, Swan Boats gliding silently across the Lagoon, the famous Make Way for Ducklings statues, and meandering paths. 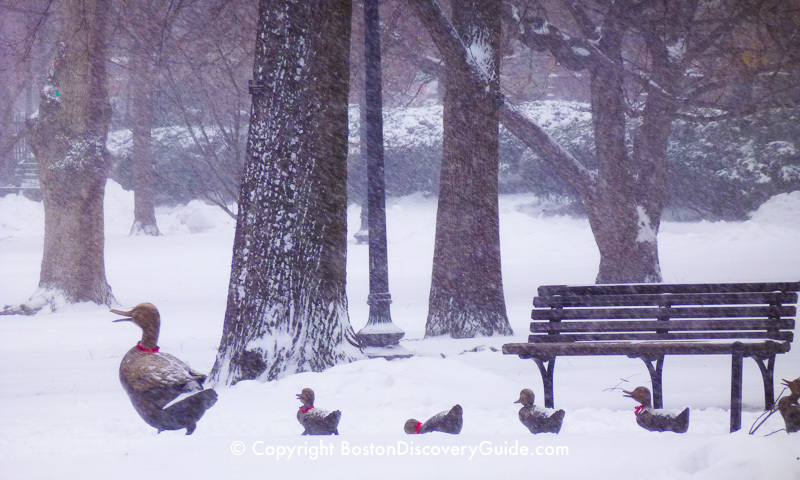 But when snow blankets everything, you may feel almost alone - in the heart of Boston. Follow the paths, and explore the Public Garden from this perspective. Water is drained from the shallow concrete-lined Lagoon each fall, but it quickly fills with snow. You can even walk in the Lagoon if you want. Don't forget to stop by to see the famous Make Way for Ducklings statues near the Beacon and Charles intersection. 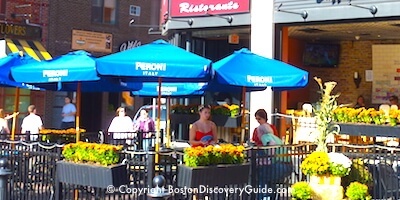 Once you have finished walking around the park, head back to the Arlington Street gate and and turn left toward Newbury Street - just past the Taj Hotel. 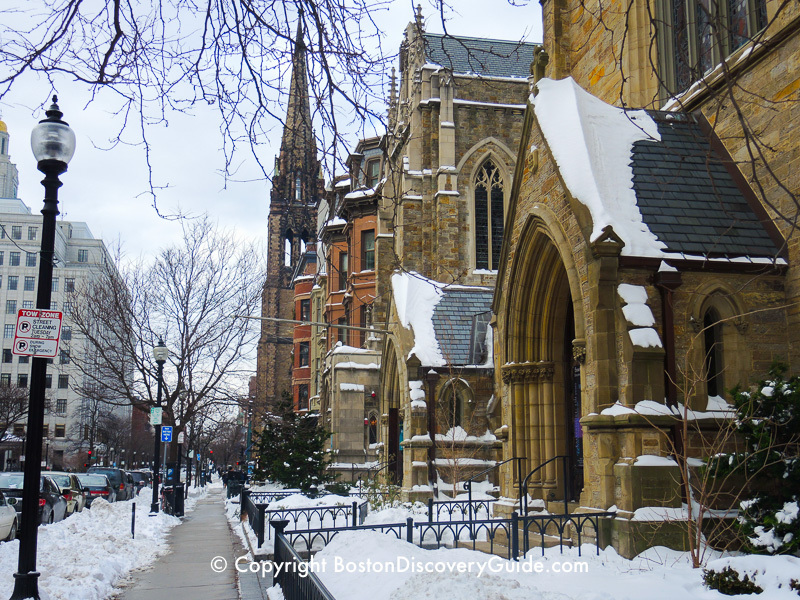 Snow makes the famous Victorian mansions and historic churches of Back Bay look their elegant best. Without the camouflage of tree leaves, you can admire architectural details hidden from view at other times of the year. Cross Arlington Street at the light near the Taj Hotel, and walk up Newbury Street to Berkeley Street. 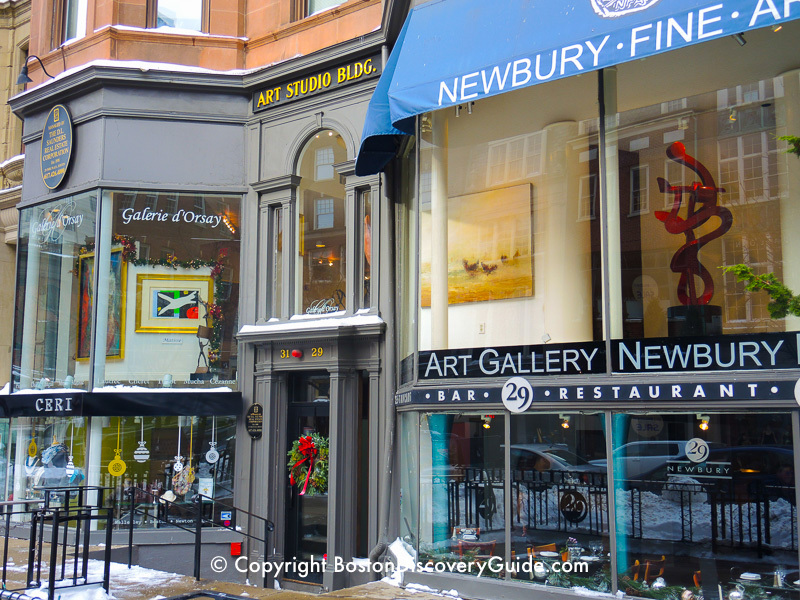 Fascinating art galleries and international designer boutiques fill this first block of Newbury Street. If you want to take a break in your walk, you'll find plenty of tempting browsing opportunities. 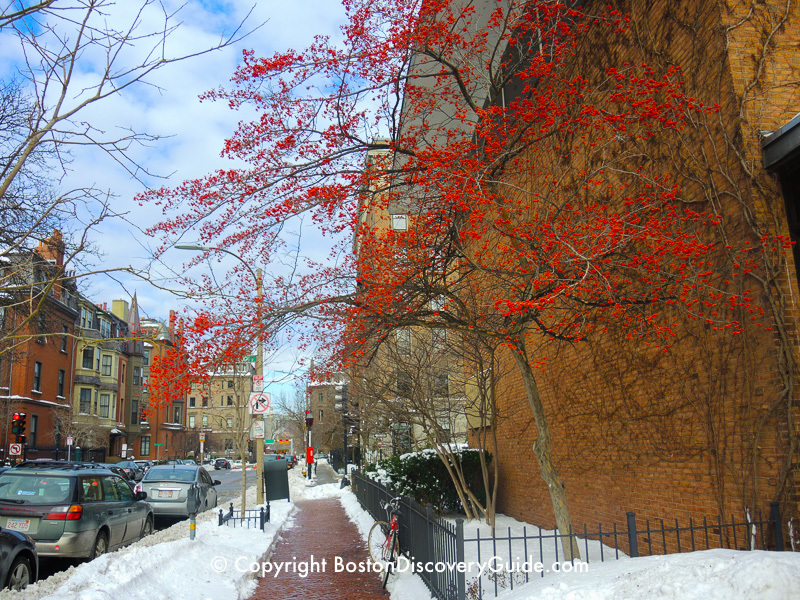 At Berkeley Street, turn right and head toward Commonwealth Avenue Mall. You'll see plenty of huge mansions along this street as well. Trees and foliage along Berkeley add surprising splashes of color against the white snow. 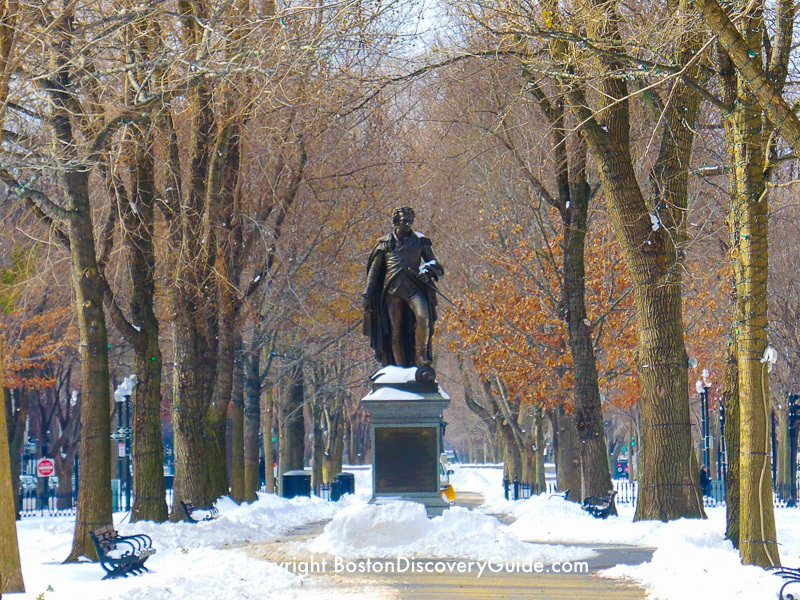 Once you reach Commonwealth Avenue Mall, the mile-long park separating the traffic lanes, make a small detour along the paths to admire a few of the many statues. Comm Ave Mall forms one of the "links" in Frederick Law Olmsted's "Green Necklace" of parks encircling Boston. 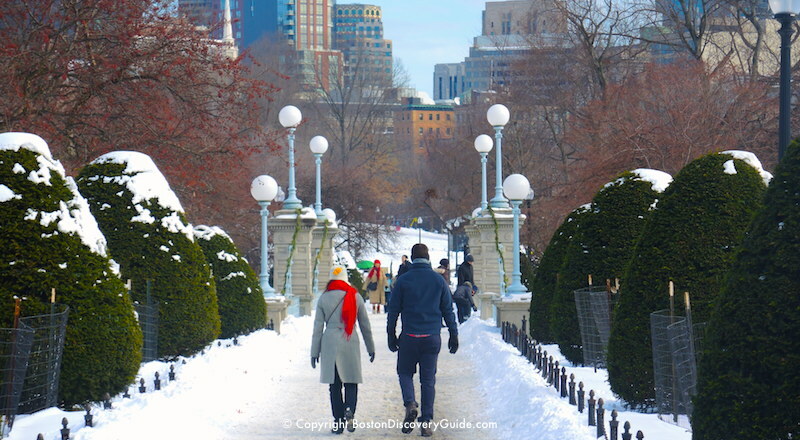 It links the formal Public Garden with the Fens, near Fenway Park and home to Boston's famous Victory Gardens and Kelleher Rose Gardens - another splendid walking route. After you've seen enough statues, return to Berkeley Street and walk past Public Alley 428 to Marlborough Street. 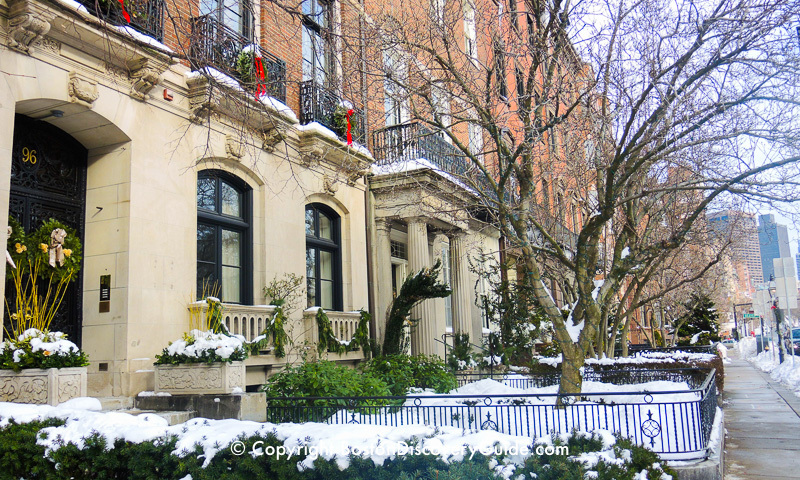 Turn right onto Marlborough Street and admire the formal front gardens of the stately mansions. At Arlington Street, turn right and continue walking past the Public Garden to Beacon Street. Cross Arlington, and then Beacon Street, and walk the short expanse of Mugar Way to the Fiedler Footbridge. 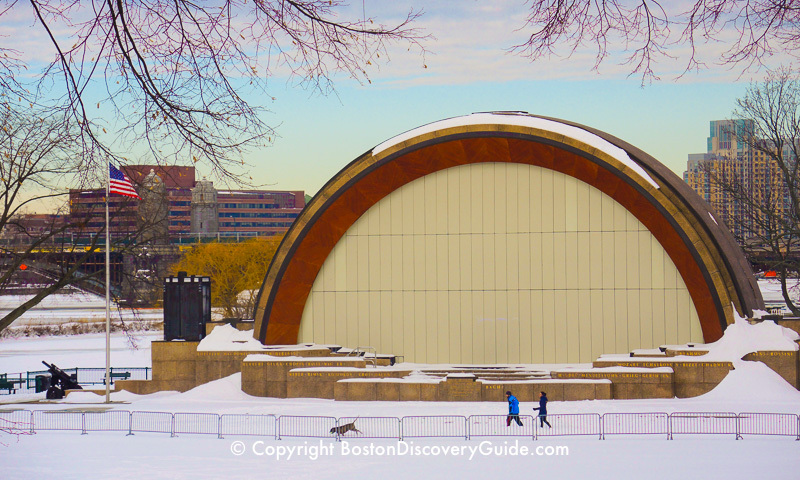 As you walk up the curving ramp of the Arthur Fiedler Footbridge, look over to the right. You will see the Hatch Shell, site of Boston's gala July 4th Boston Pops Concert - now with a protective front cover in place to shield the wood interior. 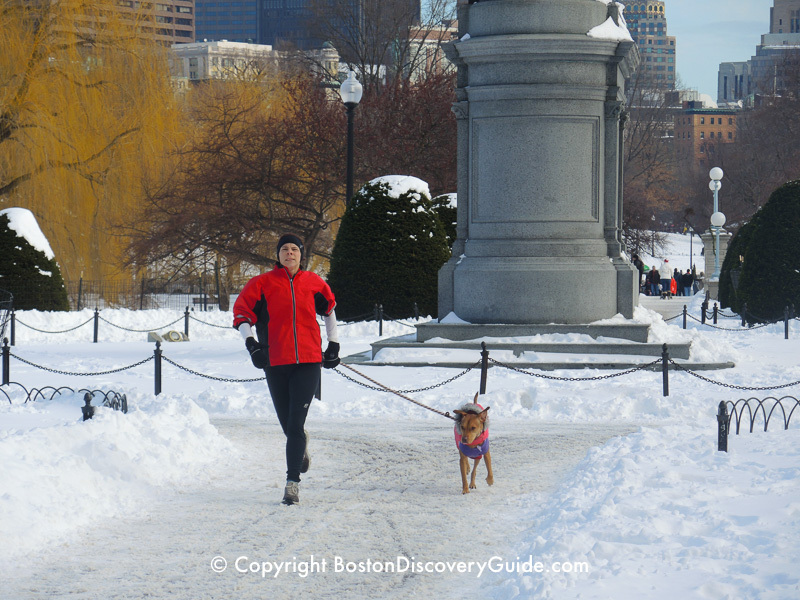 Aside from dogs and their walkers, you'll mostly see runners along the Esplanade's paths. 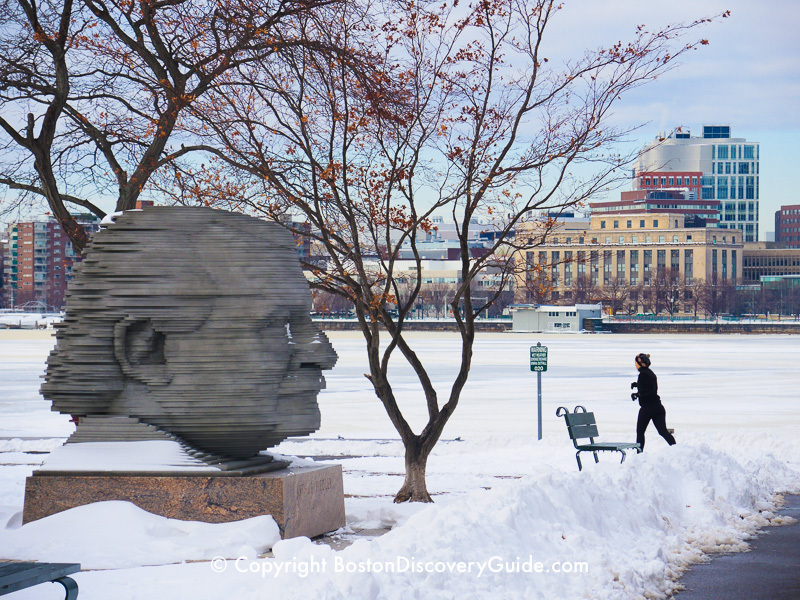 However, the bare trees of winter provide unobstructed views of Cambridge on the other side of the Charles River as well as the many statues scattered along the Esplanade. "Winter" and "sailing" don't usually go together - but for frigid-weather conditions add to the challenge for avid sailers. 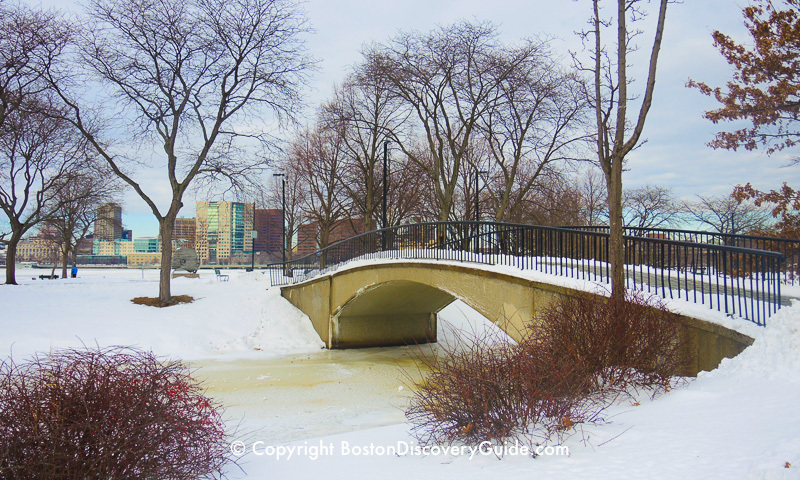 Once the temperature drops 10 or so degrees below freezing for a few days in a row, the surface water in the Charles River freezes to a more or less solid block. 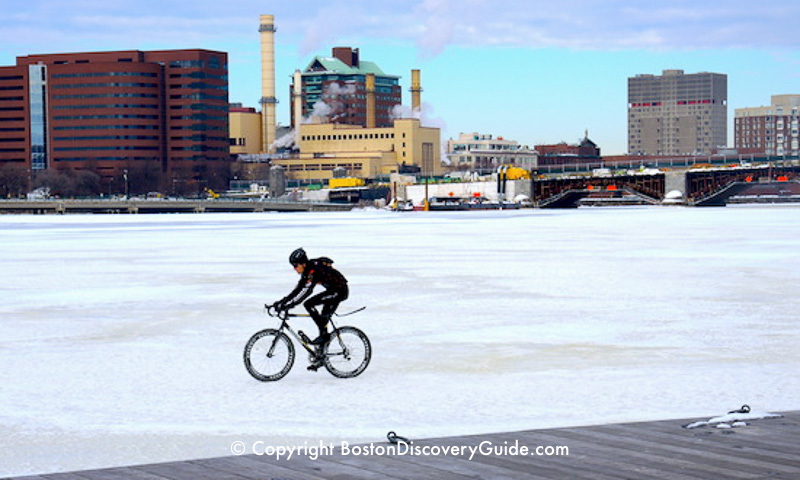 This cyclist is riding on the frozen Charles - but you can never be sure it has frozen solid, so doing this is risky. That's Cambridge on the other side of the river, and the Longfellow Bridge at the right. 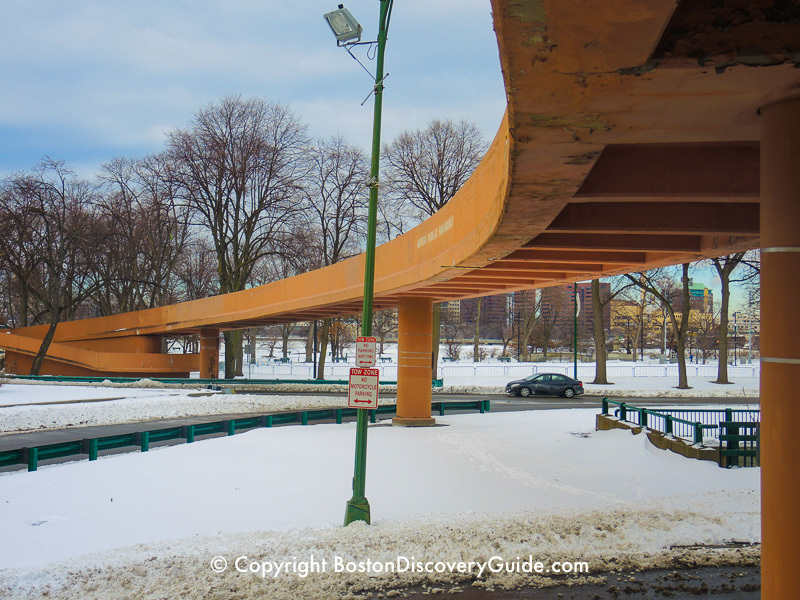 Once you've explored the Esplanade, go back over the Fiedler Footbridge and turn left onto Beacon Street. Walk up Beacon Street toward Boston Common, admiring the mansions on your left. They are even grander than the ones that you passed earlier on Marlborough Street. At Charles Street, go through the gate into Boston Common. To join the sledders, head for the highest hill - easy to spot by the soaring Soldiers and Sailors Monument, not to speak of the sledders. 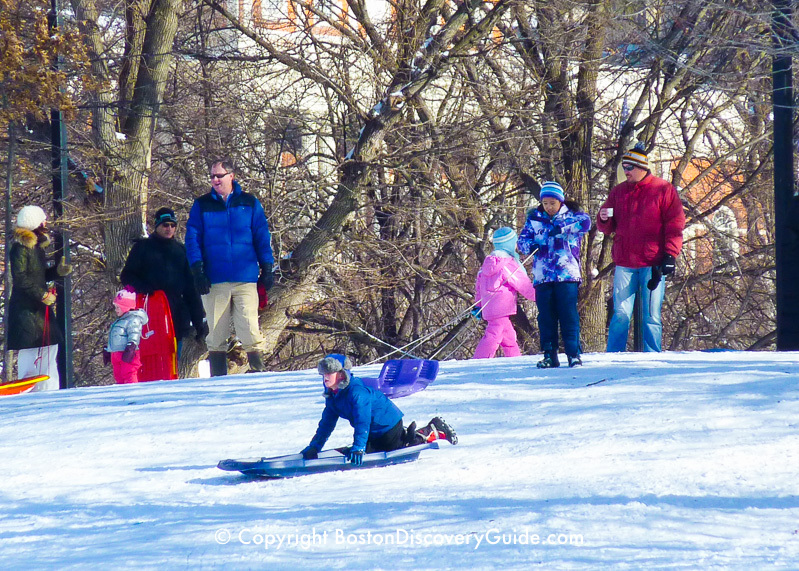 This is the best sledding hill in central Boston. Walk up the path past the monument. 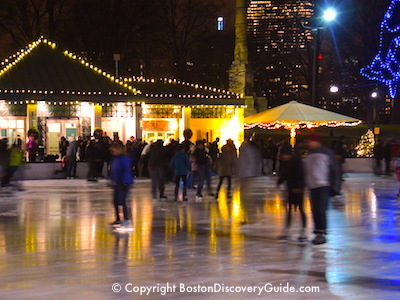 On your left, you'll see Boston Common's other wildly popular winter recreation spot - the ice rink at Frog Pond. To avoid the biggest crowds, go at night when the lights make it particularly festive. 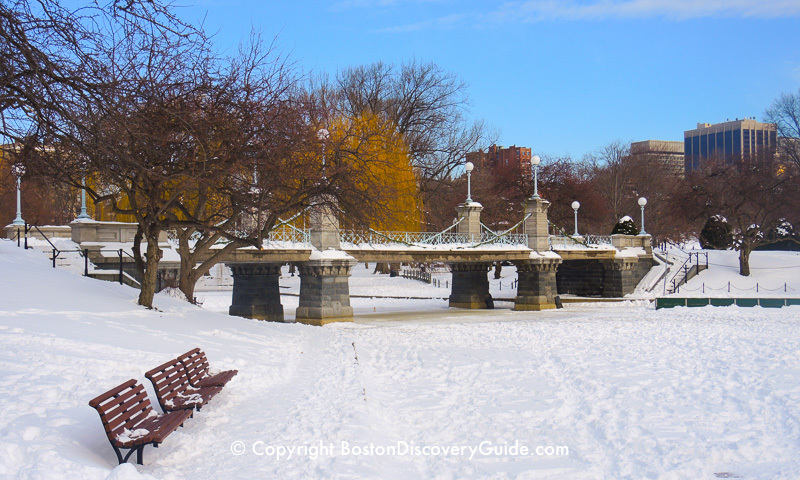 Or, continue walking around the Common and enjoying the snow-filled vistas. 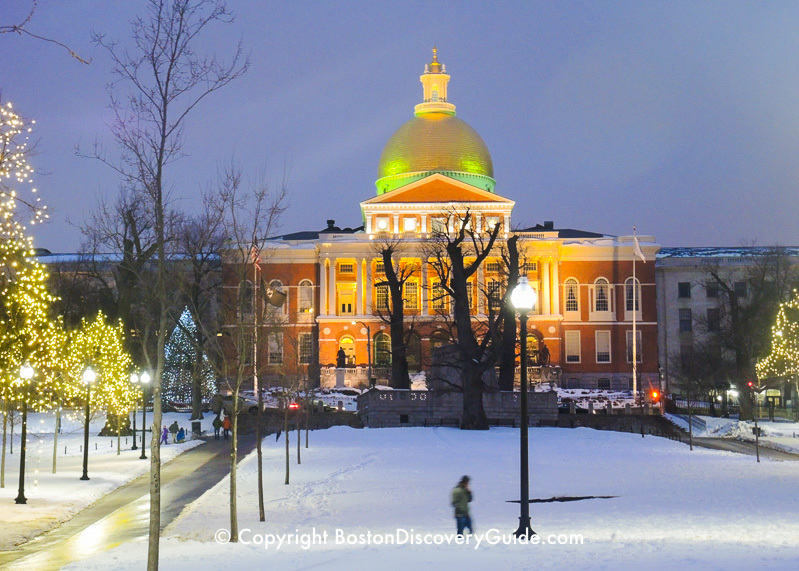 The Massachusetts State House appears particularly beautiful during the early evening hour when its golden dome gleams against the night sky. After so much walking, you may be ready to reward yourself with a tasty snack or delicious meal. 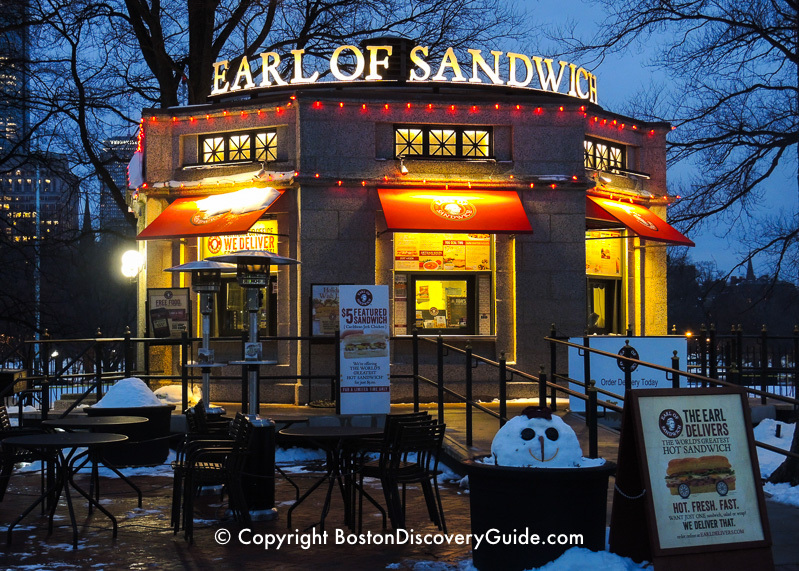 On Boston Common itself, across from Frog Pond, you'll see Earl of Sandwich. Stop by for hot chocolate, Kona coffee, hot soup or chowder, and one of their toasty warm specialty sandwiches. And save room for the fresh-made fudgey Ghiradelli chocolate brownies. Do note, though - you'll only find seating outside, which may not be appealing in the snow. If you want to sit while you eat, you'll find plenty of options in Chinatown, just a block from Boston Common. Cross the Common so that you'll end up at the corner of Boylston and Tremont Streets, and walk one more block along Boylston to Washington Street, where Boylston suddenly becomes Essex Street and Chinatown stretches out in front of you. 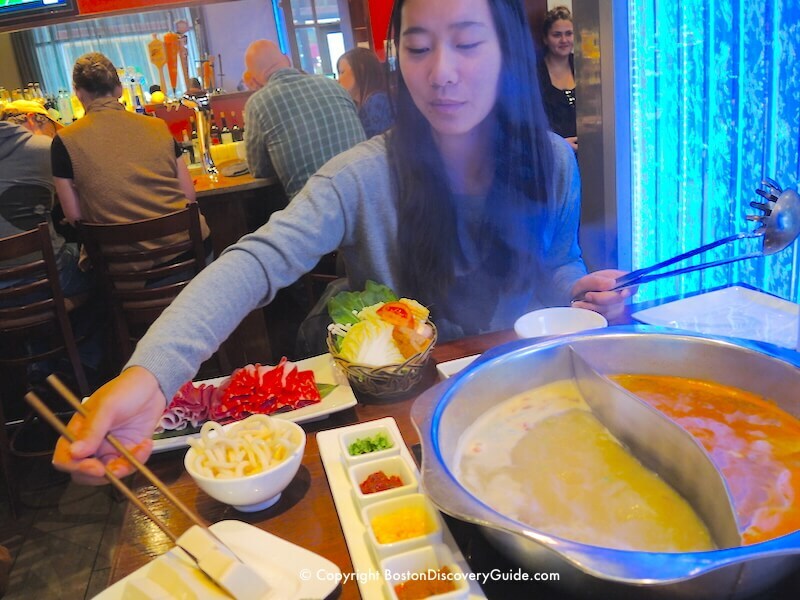 You'll find plenty of wonderful restaurants where you can go inside, get warm, and enjoy a delicious meal, including Boston Discovery Guide's recommendations - that's Q Restaurant in the photo, known for its Mongolian hot pots and sushi. 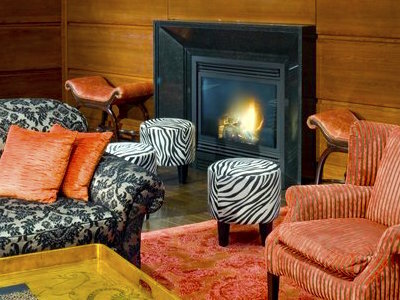 For even more dining options, check out all the nearby Theatre District restaurants. Use this map to find the walking route describe on this page. Snow gets cleared from Boston sidewalks quickly when only a few inches fall, but when the snow is deeper - say 10 inches or more - you will probably end up walking in it. DSW - 385 Washington St, Downtown Crossing, 617-556-0052 - Ignore all the fashionable but flimsy-in-snow styles and focus on their sturdier selections for women and men. Many choices under $100. Eddie Bauer Outlet - 500 Washington St, Downtown Crossing, 617-423-4722 - Wide range of outdoor clothing for women and men, including warm socks, down jackets,and ski gloves.